For all of their differences, President Barack Obama and President-elect Donald Trump share a fundamental American bond – they are the children of individuals born outside the United States. Obama’s father, Barack Obama Sr., hailed from Nyang’oma Kogelo, Kenya and arrived at the University of Hawaii in 1959 at age 23. Trump’s mother, Mary Anne MacLeod, came to Ellis Island from Stornoway, Scotland in 1929 at the age of 17. Their villages – both remote – are nearly seven thousand miles apart. 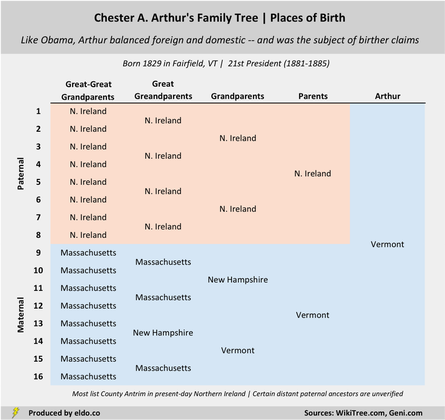 I reviewed the family trees of all 44 American presidents to determine the birthplaces of their parents (2), grandparents (4), great-grandparents (8), and great-great-grandparents (16) - a total of 1,320 family members in all. Obama and Trump are two of only eight presidents with at least one foreign-born parent. And they are the first such presidents to hold the office consecutively. 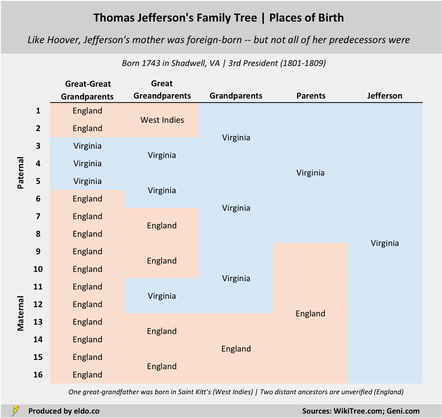 ​Jackson is the only president with two foreign-born parents and zero American-born ancestors. Old Hickory was born on the Waxhaw Settlement between North and South Carolina in 1767; his parents and two older siblings were born in present-day Northern Ireland and immigrated in 1765. Trump, Woodrow Wilson (1913-1921), and James Buchanan (1857-1861) each have one American-born predecessor in all (Trump’s father, Wilson’s father, and Buchanan’s mother). 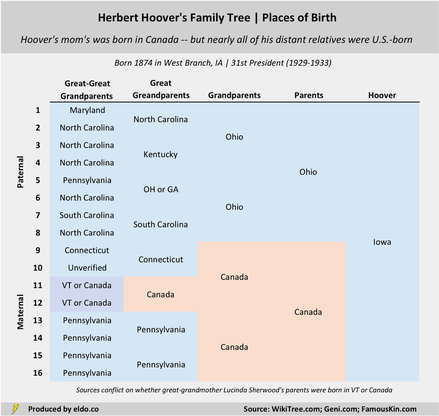 Herbert Hoover (1929-1933) and Thomas Jefferson (1801-1809), meanwhile, each had one American-born parent (both fathers), but their mothers – born in Canada and England, respectively – had other American-born ancestors before them. President Obama (2009-2017) and Chester A. Arthur (1881-1885) offer a couple of interesting parallels. Their American-born mothers' roots in the U.S. trace back several generations. 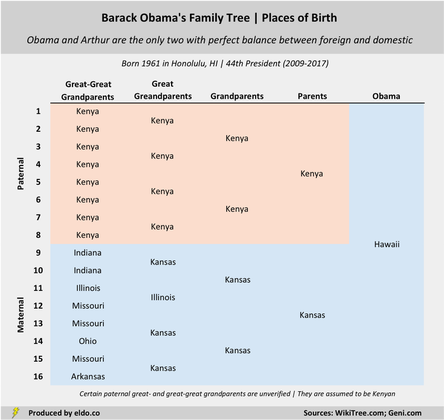 And their foreign-born fathers' roots lie exclusively overseas (Obama’s in Kenya and Arthur’s in present-day Northern Ireland). Both men were wrongfully “accused” of being foreign-born, which would have (potentially) disqualified them from the presidency or vice presidency under the Constitution's natural-born-citizen clause. Finding the birthplace for 1,320 individuals born as far back as the 1600s was no small feat. Ranges and maximums are shown in the table to reflect any instances of uncertainty.